Flipline Forum > Community > Contests > Kingsley's Customerpalooza 2013! She's Sidney. She loves red ingredients and spicy food. here is my customer, Gerald. This is my guy, Kyle! Maverick is a man in his thirties that's from Tacodale (assuming Tacodale is in the Texas area.) He is unemployed and spends lots of time at the bar. He could easily be a closer, but could also be a regular customer if his mean-looking face expression was taken away. I made one, how do I post it? 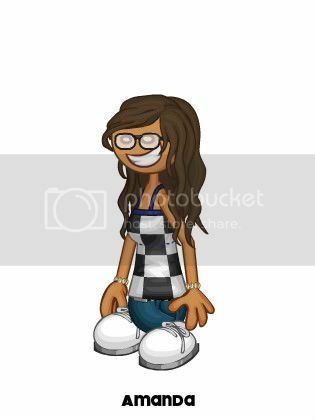 Here is my customer, Chess Girl. She is both a superhero and an international chess champion (hence the look of concentration). What happened to my character? It's gone. So as other people's characters! What happened? Somone please reply and tell me! I wonder when the new gameria is coming out? I also wonder what it is? It's time for Kingsley's Customerpalooza, where you submit your own designs for a new customer to appear in the next Gameria! Create your customer character using the official Kingley's Customerpalooza 2013 creator! You have until Friday, September 27th, 2013 to submit your customer designs! Use the Customerpalooza Creator to build a custom character, save a photo, and post it in this topic! PLEASE NOTE: This topic is only for submitting your custom characters, please DO NOT use this topic to comment or vote on submissions! We'll set up a voting process after we've collected all of the customer designs. A lot of you don't seem to be following the above red-highlighted rule so here's the thing. If you send in multiple entries, Matt & Tony will only take your VERY FIRST ENTRY and the rest will be ignored. So choose carefully on who you want to enter. Meep! Oh yeah, I'll be helping to clean up here. Here is William! His favorite color is orange. His best friend is Chuck but he enjoys having all of the customers over for parties. He is currently trying to get Trishna to date him. He likes to eat at all of papa's restaurants but his favorite one is Papa's Cupcakeria. He lives in a hotel in Tacodale but comes to Frostfield for the Summer luau. His hobbies include traveling, eating and surfing. So overall he is just a cool dude to hang out with! This is my sig. K bye. Potato is most healthy banana!